I have been missing bread doing my low-carb diet. 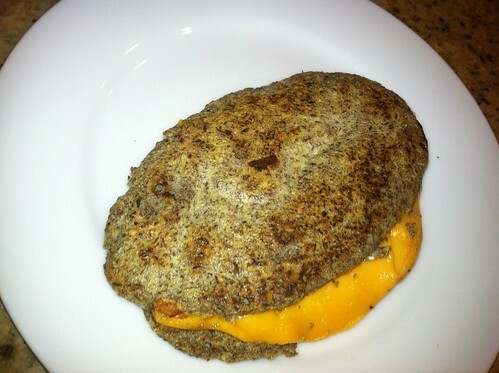 But I have found a wonderful alternative and a great recipe for a low-carb grilled cheese sandwich. True, it doesn't look like much, but this little sandwich makes me happy and it has only 5 net carbs. The "bread" recipe is inspired by the muffin in a minute recipes (muffins that are made in the microwave). Stir the dry ingredients. Then add butter and egg. Mix well. Pour in microwave safe dish (square if you can). Cook in microwave for 1 minute. Slice bread lengthwise and continue with the regular grilled cheese making steps. (Except I don't use any more butter.) I also use fat-free cheese and add chia seeds to the mix as well. I'm going to try a version with just egg white to cut down on the fat as well. Try it. It's actually pretty tasty. I hadn't seen these commercials starring Mel, the Milkbite, until Laura M. and Jason S. brought them to my attention. What did I think, they asked? Well, first let me explain: Mel, the Milkbite is a character created by Kraft to help sell a new granola bar that is half milk and half granola. It has so much milk, they say, that it needs to be stored in the refrigerator. The jingle is off-putting too: "I'm part milk and part granola, but mostly I'm confused." But then there are several more Mel the Milkbite ads including one in which Mel allies himself with a spork (because he understands coming from two worlds); and one in which he goes to art therapy, etc. which are just kind of funny-- I laughed out loud at the Dating video. The ads speak to a need to put humor into the discussions about the Mixed experience, but where does it cross the line and become mocking? I'm not sure. Thoughts? There are many people who have helped me along the way to publication & I have tried to thank them in some small way. A few years ago, I struck upon my go-to thank you gift: a tin of Anna's Cookies. They're real Danish butter cookies--just as good as my Aunt Henny makes--but with a twist. In the tin I send, half the cookies are covered in chocolate. Get it? I never really expected that anyone was really reading those notes, but then one day I got a call from Claire, the owner of Anna's Cookies. She was so excited to see that the book was finally published and she hoped she could meet me when I was in the area. It was too cool. About a month ago, I ordered some cookies but decided to send them in a new beautiful blue and brown gift box that she's offering. She called to get some information I had input incorrectly and then asked why I had changed my go-to gift. "Because the blue & brown box is so pretty and it looks kind of like it goes with my website." "Oh, you're right," she said. "How about if I change the name of the box to the Heidi Durrow Special?" And now voila! You too can buy a Heidi Durrow Special from Anna's Cookies as gift or as a gift to yourself. You won't be disappointed!